The project "Nachtischtour" is the second of its kind, related to crisis situations and possible collapses, such as that of the currency. It is a happening in which I stage the collapse of the euro. In order to continue to exist peacefully, we have to switch to alternative methods of trading. By collecting and producing goods you build your own currency, which you can then exchange for other goods. The project starts early in the morning with rudimentary aids that all work without electricity and need only muscle power and fire. 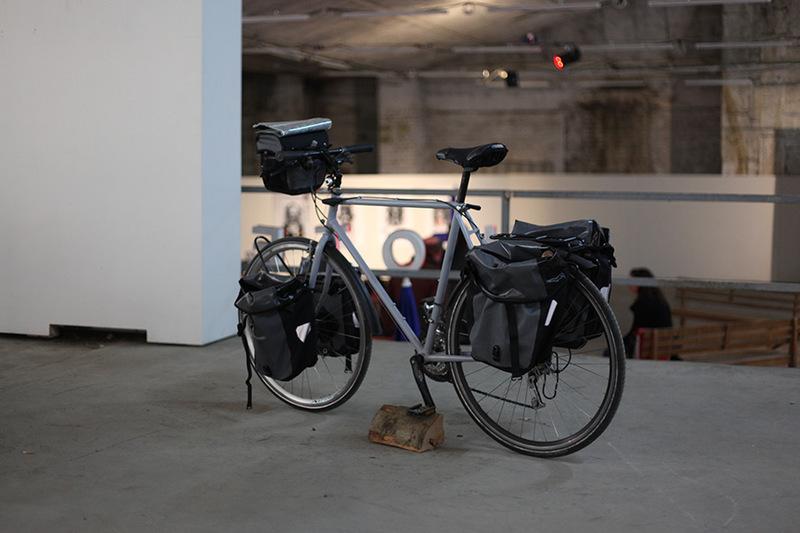 In the center is a bicycle, equipped with various transport bags - tools, identification books for plants and a trailer. I started early in the morning together with interested participants and began to explore the city by bike, looking for useful things and food. On the one hand we collected and hunted, on the other hand we exchanged. The expedition's goal was a dinner that was to be prepared and cooked in the exhibition. So we collected firewood, edible plants, water and exchanged the homemade honey for wine and wild rabbits from other inhabitants of the city who had also produced or hunted these foods themselves. We tried to catch fish unsuccessfully, because unfortunately most of the lakes were frozen in February. Back in the exhibition room, a fire was first made outside and the wild rabbit butchered. It was steamed with red wine and spices. At the same time Muckefuck (grain coffee) and dessert were prepared. 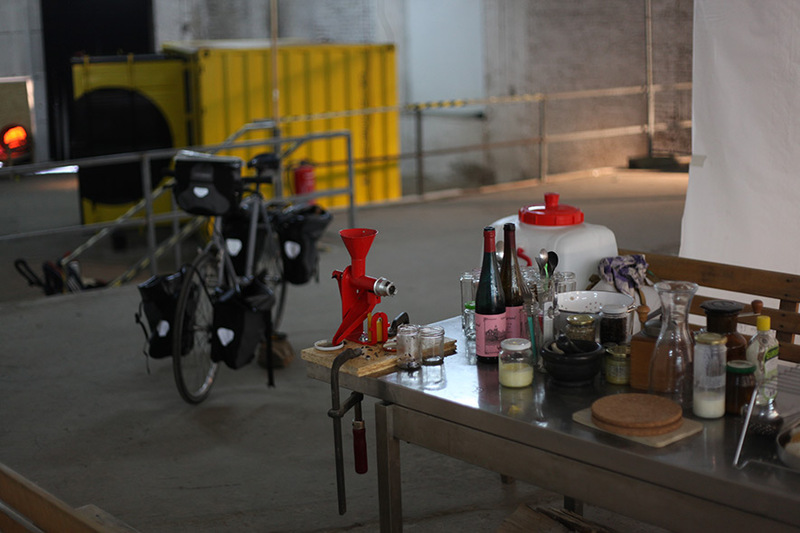 In the exhibition the bicycle was set up, as well as a kitchen in which everything was cooked. A letter was hung up in which the real occurrences and the development of the last years are described, which led to the staged, "present" situation. This project was performed in Cologne/Germany and in Dordrecht/Netherlands. In Holland I could exchange honey for wheat, eggs and apples. Together with the childrens we made apple juice and pancakes. The conversations with the children were very interesting and enriched the project very much.